Dr. Omar Durrah is an assistantprofessor in the College of Commerce and Business Administration (CCBA) in Dhofar university.He is teaching and developing many courses mainly Quantitative Methods, Statistics in Business and management. Omar contributes in developing of the master’s program being a member of the Graduate Studies Committee, and supervises of many of the Master students in management. He regularly teaches on the master program for material research methods in management. His researchesfocus onmanagerial, behavioral and psychologicalsubjects, such as organizational learning, TQM, emotional intelligence, psychological capital, psychological empowerment. He is interested in the application of researches in the field of health organizations being a former ManagerialDirector at Syrian hospitals. He has an interestin e-health services and how to apply them in hospitals. Prior to joining Dhofar university, he worked at the Philadelphia University, Jordan, and was a Chairman of the Department of Business Administration at AlittihadPrivate University and a lecturer at the University of Aleppo, Syria. 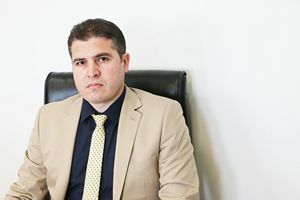 Omar studied business at the university of Aleppo, graduating in 2002, he completed a master’s degree at Ain Shams University, Egypt in 2007, and began his career at National hospital in Aleppo in 2007 and completed his doctoral study at Aleppo university, Syria in 2011. The Role of Organizational Excellence Policies in Improving the Quality of Banking Services in Dhofar Governorate. The Role of the Application of Best Practices in The Promotion of Competitive Advantage in Service Organizations. The Impact of Organizational Culture on Knowledge Sharing among Faculty Members in the Dhofar University. The Impact of Social Responsibility on the Performance of Petrochemical Companies in the JanobAlsharqia Governorate in Sultanate of Oman.